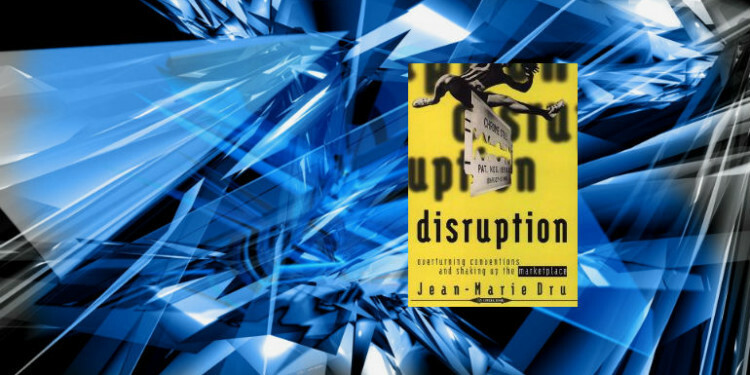 Writing about advertising and branding, Jean-Marie Dru describes the Disruption method he used at the global advertising agency BDDP Group. Identifying conventions, finding disruptions, and developing a guiding vision form a cycle which can break through creative blocks and create powerful new concepts. Although he focuses on advertising, Dru emphasizes widely applicable themes: breaking with the past, questioning assumptions, staking out new territory and taking a step towards the future. In Disruption , Jean-Marie Dru gives examples of disruptive advertising and branding campaigns from both US and Europe and describes differences in creative approach from the two continents. He highlights how impactful creative ideas can shift consumer perceptions and get people thinking differently about products, brands, and companies. As an advertiser, Dru believes that the Disruption method is the way agencies can powerfully affect their clients’ businesses. This book is about the power of creativity and the importance of a forward-looking perspective to dislodge existing conventions. Disruption must be cultivated like a discipline. Dru views Disruption as a way of thinking and finding opportunities. It is methodical to the extent that it is achieved through a cycle of finding widely accepted assumptions (conventions), developing discontinuous and differentiated concepts (disruptions), while guided by a strong point of view (vision). However, he does not prescribe a sequence to these steps because creating a disruptive campaign can’t be achieved in a formulaic manner. Likewise, since creativity cannot be scripted, the Disruption method “strives to be open” and non-linear. One of the tools Dru describes in the book is the “Disruption World Bank”, an agency-wide on-line repository of disruptive case studies that serve to stimulate new thinking and provide patterns for new creative ideas. This resource is used for training, inspiration and reinforcing the vision-convention-disruption model through examples. Each time we discover a universal attitude or behavior, something that embraces the greatest number of people, and we capitalize on it befor the competition does, we find the seed of a disruptive campaign. Dru finds that, for advertising campaigns, sources of disruptive ideas “lie at the crossroads where three groups–advertisers, consumers, and agencies– converge.” Marketers and advertisers typically create tangible ideas; consumer insights can be made available for the second group, and advertising “registers” serve as a framework for the third. Advertising registers are a way of thinking about the level at which a campaign hits consumers: top of mind awareness, highlighting an attribute, emphasizing a benefit, staking out a territory, reflecting a value, or claiming a role. Tangible marketing ideas, consumer insights, and advertising registers provide the signposts for disruptive opportunities. Dru introduces the concept of a “disruption interval”–the the time between when the client briefs and the agency and when the agency brief the creative team. This time is usually very short, but it is also very rich. This gap must be defended because it’s where the central creative idea is formed. Never seize upon the first idea that simply contradicts the convention. Conventions are departure points for creating intrusive strategies which in turn lead to unexpected executions. Vision precedes convention because the strength of the guiding idea provides the force to up-end the status quo. Identifying conventions in the absence of a guiding vision does not focus creative efforts sufficiently for a disruptive result. Always asking “why” will lead you to ask “why not?” A “discipline of doubt” enables an organization to continually question itself and its frame of reference. This continual reflect enables initiating and energizing the virtuous cycle of Disruption. In order to define a vision, the entrepreneur brings together two worlds. His inner world and the world around him. His imagination confronts reality. If the two meet, the brand will be strong. When you close your eyes, you see your inner world. When you open them, you see the outside world as it presents itself. If you keep one eye open and the other one closed, your sight is blurred, but you find your vision. When you look through a telescope, you have to close one eye if you want to see farther. For Dru, vision is developed by understanding not only the competition, the client’s business, and the consumer, but also by identifying a long-lasting selling idea. The selling idea must be flexible enough to support multiple implementations and take the brand or company confidently into the future. This book is visionary in its own right. Published in 1996, it had a website of its own and the final two chapters are focused on how internet media will transform the agency industry. Dru describes the multi-disciplinary digital agency of today and begins that section with this introduction: “As the final lines of this book were being written, the navigational software, Netscape, has been public for six months.” Dru is currently the Chairman of TWBA. I have been fighting all my life so that the briefing to the creatives will be a very special moment.